Rich and creamy, this classic New York Style Cheesecake is always a crowd-pleaser! Made with a graham cracker crust and an ultra creamy filling, this is sure to become one of your favorite cheesecake recipes. If you’re a cheesecake purist, this post is for you! Because today we’re learning all about classic and creamy New York Cheesecake! 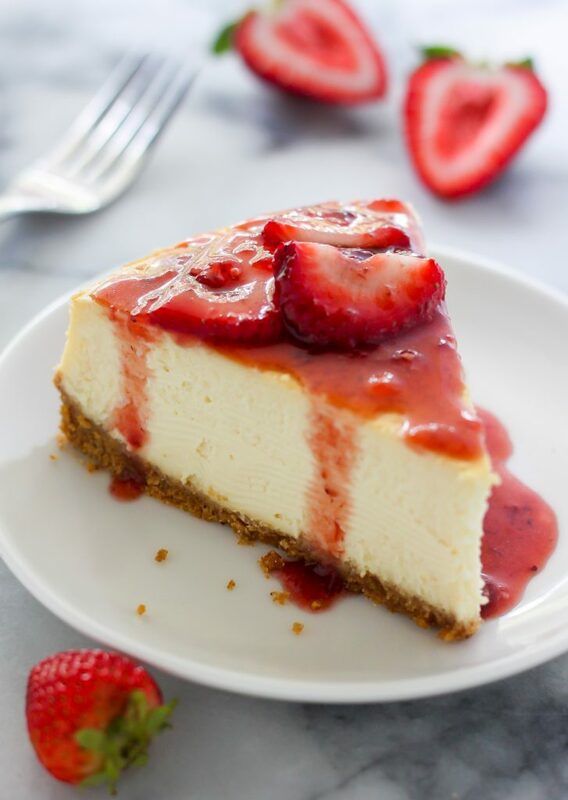 Beginning with that thick and buttery graham cracker crust you know and love, topped with a seriously smooth cream cheese filling, and finished off with a fresh strawberry sauce. 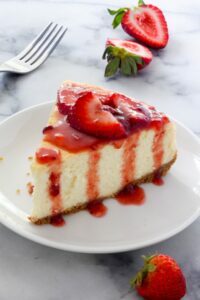 I have no doubt after one bite you’ll consider this the world’s best cheesecake recipe! graham crackers crumbs: for the crust! you can buy them already crushed or buy sheets of graham crackers and pulverize the in a food processor. melted butter: our binder for the graham cracker crust. cream cheese: always use full-fat cream cheese and make sure it’s at room temperature – or softer – before making your batter. sour cream: adds richness and a delightfully tangy flavor to the cheesecake. vanilla: just a dash will enhance all the other flavors in this recipe. eggs: this recipe calls for whole eggs and egg yolks because they thicken the batter and give it a smooth texture. be sure to add the eggs one at a time, and beat on medium speed until just combined. 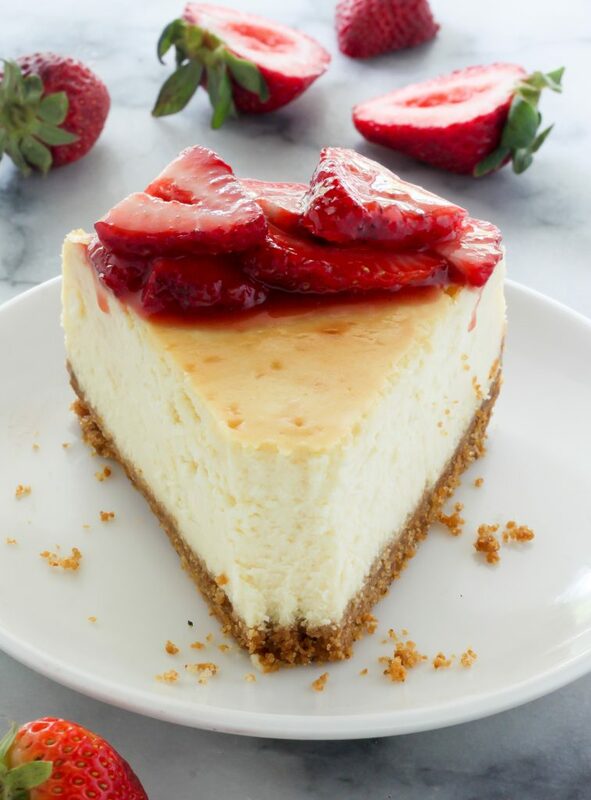 flour: just a touch of flour gives this cheesecake it’s trademark dense yet creamy texture. heavy cream: this final ingredient is KEY! it makes the cheesecake insanely smooth and creamy, and should not be replaced. if you’re going to want to make homemade whipped cream, you can use this ingredient for that, too! Of course you’ll also need a cheesecake pan! This 9″ Springform pan is my absolute favorite. PRO TIP: BE SURE NOT TO OVERBEAT YOUR CHEESECAKE BATTER! THIS ALLOWS TOO MUCH AIR INTO THE BATTER, AND WILL CAUSE THE CHEESECAKE TO EXCESSIVELY RISE IN THE OVEN, THEN COLLAPSE WHEN REMOVED. TO MAKE A SILKY SMOOTH BATTER WITHOUT OVERBEATING, BE SURE TO FULLY BLEND THE CREAM CHEESE AND SOUR CREAM BEFORE ADDING THE REMAINING INGREDIENTS. Do I have to make a Water Bath for this Cheesecake? Yes, but I promise it’s not as scary as it sounds. The water bath helps the cheesecake stay nice and moist! And it also ensures a crack-free presentation. The best type of pan to use for a water bath is a roasting pan or any other large baking pan with sides at least 2 inches high. You need a pan with high edges so you can put enough water into the pan without it overflowing. The best way to prepare a water bath is to place the wrapped cheesecake pan into the roasting pan, place the pan into the oven, and then – very carefully – add 2 inches of water into the pan. Since this recipe uses a springform pan, you’ll need to wrap the bottom and sides of the springform pan first with aluminum foil to prevent water from coming through the bottom. To quote Mary Berry, “nobody likes a soggy bottom!” lol. So play it safe and use MULTIPLE layers of heavy duty aluminum foil. You’ll want to bring the layer all the way up the sides of the pan, and in a crisscross pattern. I hope that helps! If you’d like to avoid making a water bath at all costs, you can place the roasting pan full of water on the rack beneath the cheesecake. This work about 80% of the time for me, but occasionally when I do this I still get a little crack or two. But if you plan on covering this cheesecake with strawberry sauce, a few cracks aren’t the end of the world. Yes, of course! Baked cheesecakes freeze great! Simply cool the cheesecake completely, then wrap the whole cheesecake, or slices of the cheesecake, in multiple layers of saran wrap, then place in a freezer bag. This cheesecake will keep, stored properly in the freezer, for two months. To defrost the cheesecake, simply thaw the wrapped cheesecake in refrigerator overnight. Do not attempt to thaw cheesecake in the microwave or oven! AND IF YOU TRY THIS BEST NEW YORK STYLE CHEESECAKE RECIPE, LET ME KNOW! LEAVE A COMMENT BELOW AND DON’T FORGET TO SNAP A PIC AND TAG IT #BAKERBYNATURE ON INSTAGRAM! SEEING YOUR KITCHEN CREATIONS MAKES OUR DAY. Place pan in the oven and cook cheesecake for 1 hour and 15 minutes. Turn oven off and let the cheesecake sit, undisturbed, for 45 minutes inside the oven with the door shut. The cheesecake should be still slightly wiggly. Process 1 and 1/4 cups of strawberries, sugar and lemon zest in a food processor or blender until smooth. Transfer mixture to a medium-sized bowl, stir in remaining sliced strawberries, and chill for at least 1 hour before serving. Michael is drooling and jabbing me in the ribs hella hard right now. Hi! Question…when you refrigerate after running knife and letting sit for another 15 do you leave it in the spring form pan? Do you leave the foil in it? I have same question, after running knife around pan do I take spring form off or before serving .? The BEST cheesecake I have made! My family says it’s fantastic!!! It’s the only recipe I’ll make from now on. Do I also cover up the top with foil or just the bottom? This came out perfect and the flavor . This is the best cheesecake I have had thus far. I would suggest wrapping the cheesecake cake pan in a slow cooker liner before wrapping it in foil to ensure that no water seeps in during the baking process. Thanks for the delicious recipe. I love the slow cooker liner suggestion. Thank you for the tip. This looks so creamy and delicious! Love your tips, I am a cheesecake lover! I love all the cheesecakes but New York style is my favorite favorite. So hope you don’t mind that I’m drooling all over your blog! I’m about to find out how this turns out without the flour added. I didn’t see until just now where the flour was supposed to go. After it was in the oven baking already of course! Hi Gigi. I would bake it anyway, dear. It will come out delicious, just a little less thick. I’ll be finding out tonight how it tastes without the heavy cream. I was following step by step instructions, came to the add cream part & thought it meant the sour cream which was already added so I figured I already did. Later as it was in the oven I realized that I had bought “heavy” cream for the recipe & I didn’t remember adding it, that’s when I realized looking back at the recipe that the “cream” was “Heavy” cream. ☹️ Hopefully the strawberry sauce & fresh whipped cream (that I’ll make with the heavy cream that I didn’t add to the cake) will make up for the flavor & lack of “fluff”! Can you wrap the pan in aluminum before you put all the ingredients in the pan. ?? How long does the strawberry sauce last? I’m assuming the lemon acts as a preservative. I’m thinking of making the sauce a day and a half ahead but not sure if that’s a great idea! Hi Fil. Making it a day ahead of time should work just fine. Hi Amanda. Unfortunately, I do not think this would work in a regular pan. There is too much liquid and it will not cook properly in the glass. I hope you can find a springform pan to make this! Hi Kari. I’m so sorry water got inside your foil 🙁 I know that must be so upsetting after working so hard on this recipe! However, I have had this issue before and after chilling for the 6 hours it turned out fine. So don’t loose hope! Keep me updated on how it turns out – I’m crossing my fingers for you. Btw – did you use multiple layers of heavy duty aluminum foil? I find that method is best for keeping the water out. I used 4 layers and water still got in. Mine is in fridge now. Try wrapping the springform in a crockpot liner before wrapping it with layers of foil. Voila! No water seepage! Works every time. I use multiple layers of foil and tightly encase the foil with two layers of cooking twine. efforts, but I feel I wasted the entire day. If you’re nervous at all like I was, I would try anything to avoid the water bath! I read another post that said to maybe try filling a pan with water and placing it on the lower rack, with the springform pan on the rack above. If I ever am brave enough to attempt this again, I will avoid placing the springform pan in the water. Hi Hannah. I’m so sorry to hear this didn’t work out for you. Especially on Valentine’s day. I can only imagine your disappointment. A quick question: Did you wrap the foil all the way up the sides of the pan at every angle? The foil should go to the top of the pan and tuck over slightly. That’s really what prevents the water from seeping in. I tend to use 8 to 10 pieces of foil, wrapping them in opposite directions and really pressing them up and in to ensure there’s no way water is seeping through. I think I’ll do a video on water bath techniques soon and add it into this post, which will hopefully help! Just put the pan in a oven safe turkey bag and then cover that with foil. Works like a charm. Hi I find that not wrapping foil around spring form pan and not using a water bath works great for me! !Beasuse the last cheese cake I made used hot water in a oven safe large glass measuring pitcher, placed on cookie sheet, under the spring form pan gives enough moister to keep cheese cake from cracking.. it’s been working for me. No cracks!! Used on this cheese cake, worked wonderfully. Try setting your springform pan inside of a slightly larger cake pan instead of foil. This is what I have been doing with my cheesecakes lately- adding a 9×13 pan full of water to the lower rack of the oven because I’ve also dealt with soggy crusts. Unfortunately my cheesecakes still crack. I have this recipe in the oven now and it started to crack about halfway through cooking. Any other tips to try? I love cheesecake and I’ll eat it crack or not but it doesn’t make for nice presentation. Plus I’d rather it crack than be soggy. Christine…a pan filled with water on the bottom rack worked well for me also. I had the Water everytime .I had a Dear Friend to share a tip me. Other than this did you change the recipe at all? That is the way I do it as well … large pan of water on the rack underneath the cheesecake. Perfectly every time! If nervous about water bath try this technique that does not require wrapping or tinfoil. Place cheesecake in cold oven. Turn on at 200 degrees. Let bake for 3 hours. Turn oven off and let sit in oven for another hour (longer if you want) then remove from oven and cover with plastic wrap and chill in fridge. You should have a creamy white (not browned) cheesecake with a smooth top and no cracks. I see that the crust, filling, and sauce all take sugar, but only the filling specifies granulated sugar… Do all three take granulated sugar? Thank you so much! Hiiiii. One question, I’m planning on making this tonight and I was wondering how to cool with a gas oven? Someone recommended cooling it with my oven door shut but I’d like your opinion! Hi there! You can cool the cheesecake in the oven with the door shut, as directed in the instructions 😉 Enjoy! By far the best cheesecake I’ve done and this was my first attempt at it! And on my third cheesecake today! One for me and the other for a friend for easter! Hope she likes it as much as I do. Thanks! I made this for Easter and water got into the pan. I was so upset and almost threw the whole thing out. Luckily, I decided to just stick it in the fridge overnight and try it the next day anyway since I worked so hard on it Thanks goodness I didn’t throw it out because everyone loved it Next time I will definitely use heavy duty aluminum foil! Made this for Easter and everyone went crazy for it. I’ve made a lot of cheesecakes in my day, but this was voted the best ever. I’m planning to make this again, wanting to try in my 5.5″ springform pans. I think I can divide the recipe into thirds but I’m not sure about coming times. Have you ever tried this in smaller springform pans? Any tips on adjusting cooking times? Thank you for sharing this recipe! Total win! Wendy, this comment made my day! SO happy this cheesecake was a hit 😉 I’ve never tried baking this in a smaller pan, but I think you’ll need to cut the baking time in half. You want the cheesecakes to have just a little wobble in their centers. I’d love to hear how the mini version turns out! I just made it with a mini pan and cooked it for the same time and it came out perfect! Just baked this for my grandaughter’s birthday and it looks devine! I can’t wait to take a bite but I must wait for the birthday girl! Hello. Was looking to make this today. Can I substitute whole milk for the heavy cream?? Thanks so much!!! Hi I was just wondering… I saw your reply saying that you have never used cream but your recipe calls for cream… should it be something else? Hi there, i am making this tonight. I have made it before and it is amazing. Everyone always raves about it. Unfortunately, my 9in springform pan has come up missing and all I have is my 10in. Is there a way to add a little more to it to make it work? Made this for Mothers Day and it was absolute perfection! Covered it with mixed berries and it was such a hit! Thank you for sharing! I followed the instructions step by step and my cheese cake still cracked. Any suggestions as to what I might have done wrong. ? This is quite possibly the best cheesecake recipe Ive used. I added lemon zest and extra vanilla to my cheesecake mix. I also doubled the crust recipe since I like it to go up the sides. But the flavor was amazing and the texture was perfect!!! LOVED it!!! Hi Martha. A little browning on top is totally normal. If you’d prefer it not browned at all, place a piece of tin foil loosely on top of the pan for the last 30 minutes of baking. Could you tell me how many graham crackers it takes for 2 cups? Quick question when do we use the whipping cream? Made this for my husband’s birthday & it was the best cheesecake I’ve ever made! Water did get through my 5 sheets of foil, but I just took the outer ring off and let it sit uncovered in the fridge for a few hours and it was fine. Mine cracked too, but I don’t think I had enough water in the pan and I’m not too picky about that. Was thick, creamy yet light- everything Rachel & Chandler were talking about in a cheesecake! This means 2C of graham crackers crumbs, correct? Does it mean use 5 eggs total? 3 whole and just the yolks of 2? Hello, sorry for bugging in on your conversation. Do we whisk the eggs seperately before adding them, like in other recipes? When do you take the cheesecake out of the springform pan? Before you put it in the refrigerator or right before you serve it? Hi Lynne. You chill the cheesecake in the pan, then remove right before slicing and serving. I’m so excited about this recipe because I’ve never made a real cheesecake before!! But was I supposed to use unsalted butter?? Just took this out of the oven – it looks good despite the cracks on the top, though that was probably due to the fact that I added crumbled red velvet cupcakes to swirl into the batter (this was my son’s choice of a birthday cake and it’s what he asked for lol) Sadly even with 5 layers of aluminum foil there was still an extreme amount of water that got to the pan – I’m waiting for someone to invent a disposable aluminum liner to use for cheesecake baking – like the foil pans you can bake brownies in but only to fit around the outside of a springform pan lol I loosened the outer ring to let some air get to it to hopefully dry up a bit more before putting it in the fridge. Despite my mishaps I’m sure this cake is going to taste alot better than it looks! 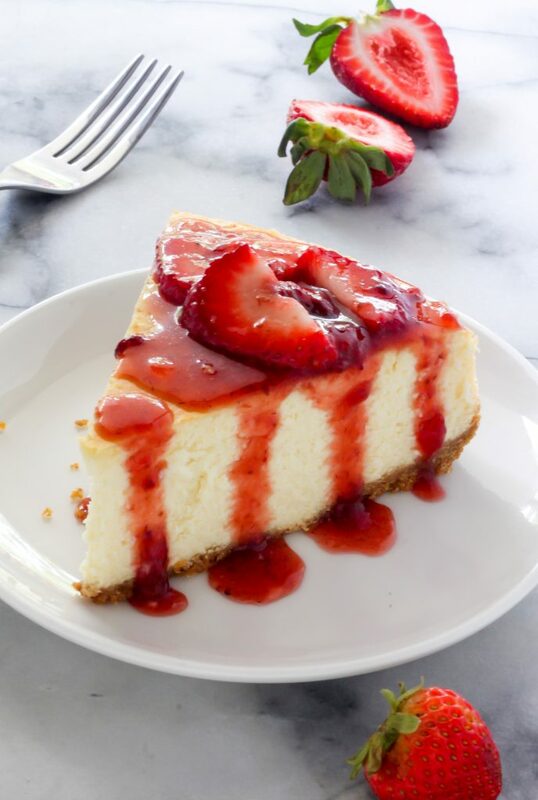 I’m making this tomorrow and have never done the water bath when making previous cheesecakes. I’m scared of the water breakthrough that others have had so I’m going to not only do the aluminum foil but also put a crockpot liner around it before putting it in the water bath. This way no way no water will get in and I’m not going to have to worry about about plastic wrap melting. I’ll try to come back & report how that works out. Hi! I’m going to make this cheesecake for a friend on Friday and had a question. I will be making this in a springform pan a I always do but wanted to know how I would remove it from the pan and what do I put the cake in to give it to someone? For myself I usually just leave it on the bottom of the pan and cut it that way but what would you suggest seeing I have to remove it? Also the topping will be on the cheesecake when delivered. I’m interested in baking this cheesecake. Since Theo my pictures that are shown are with individual slice, I was wondering how to properly display the cake for the holidays? Should it be displayed plain and if someone would like the topping, to then apply it? If not, how should I arrange the topping on the entire cake. Thanks! I am making this cheesecake for Christmas. We followed the instructions carefully so we hope it turns out great. I’d like to print the receipt. Can you email it to me? Cab you use frozen strawberries? I LOVE cheesecake, and have dozens of recipes I’ve collected over 40 years. This recipe has become my favorite! Followed recipe to a T. Use wide heavy duty foil so there is no chance of leakage, and I used two layers. The whole family loved It! This was easy and the BEST cheesecake ever!!!! Made this Cheesecake for Christmas followed the directions and it came out GREAT! Thanks for the recipe. Definitely a keeper! Next time going to Oreo Cheesecake. I have made this cheesecake about 2 times already and it is a hit!! Im going to make another next week but the sour cream i have is reduced fat not full fat, would that mess up my cheesecake? How many graham crackers does it typically take to get 2 cups? And should they be honey graham crackers? Hi Lauren. Plain graham crackers are fine! I usually need 2 sleeves or so to get 2 cups. Very smooth. Not rich at all. 🙁 Made this today! And i had water seep in the pan. My advice to anyone after me…dont water bath unless you’re confident you’ll get it right. I would take a few cracks over a wet crust anyday. The bright side..I made a smaller one using a 6″ springform pan without the water bath and it takes absolutely yummy!!! I am planning to make it in a 7inch foam pan,, how shall I work with the baking timings? Will they remain the same? Hi so I’m baking a cheesecake for my boyfriend’s birthday on Monday. I’ve never made a cheesecake before so this might sound like stupid question but I see the ingredients say sugar and granulated sugar, what’s the difference? Just asking to make sure I buy the right kinds! Thanks so much. Can i use splenda instead of sugar in this recipe? Will it affect the results? I wouldn’t recommend it. It will most definitely change the taste and texture of the cheesecake. I LOVE LOVE LOVE this recipe. Everyone that has tried it thinks I’m a phenomenal baker! Ha! But really it’s quite an easy recipe to follow and omg so decadent and creamy! I’ve been looking for ways to mix up my cheesecake, to appeal to more tastes, like and Oreo cookies and cream or Reese’s peanut butter and chocolate, or just plain chocolate. What or where do you recommend making additions or substitutions? I don’t want to mess with the texture or consistency. Thanks!! I would like to make these in a cupcake form so it’s easy to share at school or at a potluck at work. Any suggestions? I am going to try it on my own combining what I know, timing and water bath and hoping it comes out well. Thanks for the recipe. Looks delicious!! I’m hoping to make this this weekend for Mother’s Day, but I have a 12 inch spring form……Thoughts on how to adapt? Hi Mary. I’ve never attempted this in a 12″, but I would advise baking it for a shorter amount of time, since it will likely cook faster. I’d say to bake for an hour, then follow the directions as written. I hope that helps, and you have a great Mother’s Day! So I suggest skipping the water because I wrapped it as suggested, with 5 pieces of overlapping and cross cross foil and it was all the way up and the water was only at the halfway point. Still somehow water managed to get in and it’s totally ruined and you would never realize it until you have wasted hours baking it. Hi I was wondering what the baking time would be if I used this recipie in the mini 4 inch pans, if I baked 3 at a time would the baking time still be the same? Would I have to do anything different to make this a crustless cheesecake other than not make the crust ??? I’m making a cake and want this cheesecake in the middle. Hello! I made this recipe today, and sadly water got in my cheesecake pan! The crust was soggy, but I continued through and chilled it in the refrigerator. I just felt of the crust and it’s feeling less soggy! So fingers crossed that all the water evaporates by morning! Thanks for sharing this recipe! Hi Abby! How did it turn out? Sometimes when you remove the tin foil from the pan it will look wet, but it’s actually just condensation. Can you cool faster in the freezer?? Nice New York cream cheese cake. I am Keeping following. Thanks for showing it 🙂 . can you substitute the gram crackers for Oreo’s? If I use a glass 9×13 pan, will it work? How long will it take to bake? How did it work in a 13×9 inch pan? Did you need to adjust baking time? How would you adjust for high altitude? Thank you for the tips and tricks portion. Specifically the reason I am following your recipe. What’s the difference between sugar and granulated sugar? Sugar and granulated sugar are usually the same, but I specify granulated so it’s clear not to use brown sugar. I haven’t had the nerve to make cheesecake in a very long time unitl I saw all of the nifty tricks you put into the instructions. I made this cheesecake for our thanksgiving dinner yesterday. It was absolutely perfect and I am extremely critical of my own work! I split the recipe by using 2 pie crusts from the grocery store due to time issues (being rushed to hurry) but it made 2 perfect cheesecakes pies! I will definitely be using this recipe again for Christmas and probably more of it! Did you end up reducing the baking time when you split in two? How long did you bake it for with the pie pans? Did you still do a water bath? Can you eat this if it doesn’t cool for 6 hours? Can I make this the day before eating? Will it sitting in the fridge for a day be ok? Oh. My. Goodness. This is amazing. But it is very time consuming, so make sure you allow for it. Also, I used a slow cooker bag under the foil; and I am so glad. I had 6 layers of heavy duty foil, and there was still water in the foil. Everyone at our New Year’s lunch loved it. I made this cheese cake for our new years eve party. I was so nervous about it turning out. I followed your instructions and your tips.. My cake came out PERFECT!!!! Thank you for your recipe. I am checking out your other recipes now. In our family I am the cook and the baker. I am proud to say that I am especially well known for my cheesecakes. I always make them around the holiday time. I’ve had a receip that I’ve used for years and everyone has really liked it. This year I decided I wanted to try a new recipe. I did a Google search for “perfect cheesecake” and this recipe popped up first. I read the directions and I really liked the level of detail in the instructions. After I read through it twice I decided to give the recipe a try. The first time I made it I was impressed with the consistency of the batter. My old recipe can be ruined if it’s over beaten. That doesn’t seem to be true for this one even though I didn’t over beat the batter. I like that it stays in the oven after the time is up. I would always use an instant read thermometer to make sure my other cake was done and it was a little hit or miss depending on the recipe. It worked for NY cheesecake but it didn’t work for my pumpkin cheesecake. So I was glad that I didn’t have to stress about that with this recipe. First time I made it I brought it to a Christmas party and people actually raved about it. They couldn’t stop saying how much they enjoyed it and it made me feel good. I made it again for our family Christmas Eve party and then again just because my wife wanted cheesecake. One tip I would add is to buy some extra wide aluminum foil to wrap your spring form pan prior to placing into your water bath. It will keep the water out and the crust dry. Plastic wrap doesn’t always work very well, but extra wide foil works perfectly. This is the best cheesecake I have ever made or even ever eaten. It’s easy to make, just follow the steps in the recipe. I have found that if I measure out each ingredient prior to starting it helps me to stay on track and not forget any ingredients. I do that no matter what I am making it just helps me. If you like cheesecake give it a try. It’s a favorite at our house and I think it will be a favorite at your house, too. This recipe is amazing. I am new to baking but I learned to follow directions word for word. Learned that the hard way tho . The list of tips seemed mandatory after I made it!. Glad you didn’t leave anything out. I have used the water in a seperate dish for making a pound cake which came out great. The water bath scared the crap out of me but I did use the wide foil in the roast pan. I tackled my fears, used 3 sheets, and I wrapped the pan tight with foil before putting it in the roaster pan. I saw the disaster of it getting my cake wet when I read it the first time but took my time just to see if it works. No leaks and it came out beautiful. Haven’t put it in the fridge yet waiting for timer from the oven being off but my mouth is watering just from looking at it. My household can’t wait to devour!! We all gotta wait til tomorrow but im sure it will be worth it!! Thank you!! & i would love to see more recipes!! And whats a dollop lol!!??? Hi! I’m super excited to make this, however I’m not sure how to measure 2 cups of graham crackers in whole form. How many cups of crumbs is equal to 2 cups of graham crackers in whole form? I just finished making this recipe.Its on its final rest before going to the frig. It looks absolutely perfect!!!. For all those having problems with wrapping the pan with foil….I actually found a 9inch springform pan…called the “perfect pan” that has its own built in water bath basin.Its so easy to use.I love it! The brand is Chef’s Planet.I hope this helps everyone. P.S.. I found it on line. Hi, I would like to make this into mini cheesecakes, would I be able to do this with this recipe and how long would I need to bake them. So excited to make this! Unfortunately, strawberries aren’t really in season. Can I use frozen strawberries? I made this for my 6 year old’s birthday, by his request. I poured half the batter into the crust and then dolloped homemade strawberry curd in 1/2 teaspoons all around, then the rest of the batter and more 1/2 teaspoon dollops. I swirled a knife through the top layer and baked as directed. Delicious!!! And beautiful! It was exactly what he wanted, and made him so happy! BTW I own a springform pan, but never use it in water baths. I always bake my cheesecakes in a normal 9 inch cake pan, with a circle of parchment at the bottom. Guaranteed no leaks from the water bath, and if I want to remove it from the pan for presentation I just freeze the whole thing overnight and pop it out. Super easy. If presentation doesn’t matter, I always serve it right out of the pan! If I do freeze it, I put it on the cake stand and into the fridge to thaw. So it does take some forethought to bake cheesecake this way, but takes lots of stress off of It, too. Can you tell me what is the difference between granulated sugar and sugar in this recipe? Unless all edges of the aluminum foil are up and out of the water, ie. like a boat, there is no way (zero chance) to keep water from making its way thru the overlapping layers. Water molecules are infinitely smaller than the tightest spacing one might achieve with diligent pressing/squeezing/wrapping. Only if the foil comes all the way up all points around the springform pan will water truly be sealed out. I made this cheesecake after making Martha Stewart’s recipe for the past 8 years and let me tell you that this cheesecake was Ahhhhhhhhhhhhhhhhhhhmazing and my new go-to! I increased the crust recipe by 1 1/2 and doubled the filling. I baked mine in a 10×3 cake pan with a parchment round at the bottom. I baked it for 1 hour and 35 minutes. Thought I turned the oven off, but DID NOT and actually baked it for 1 hour and 55 minutes. Then left it in the oven per your directions for the remaining 30 minutes. Maybe it was meant to be to accidentally bake it that long, because it was so good!! I submerged the pan in very very hot water for about 30 seconds, ran my knife around the rim and it popped right out. PERFECTION!!! Thank you for this awesome recipe! 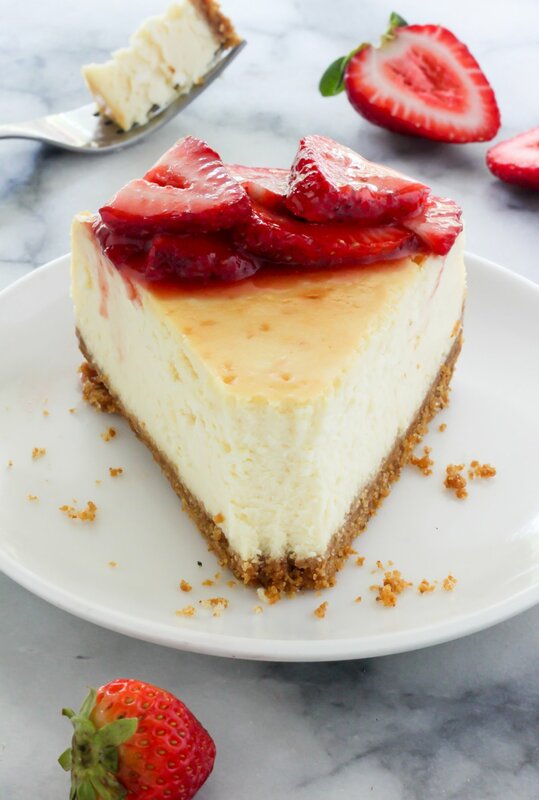 Can this cheesecake be made in advance and frozen? Hi I was wondering if you used salted or unsalted butter for the crust? Thanks! We used unsalted for our crust! Hello, I brought this strawberry cheesecake to a family function and everyone LOVED IT! Since then I have had so many people ask me to make it again. Just now my sister asked me if I could make this cheesecake for her birthday coming up but she asked me if I could do it with blueberry. So can I interchange blueberry in this recipe where you use strawberries? Thank you in advance! Did exactly as you instructed and came out perfect !! Thank you for your recipe!! Delicious!! You don’t bake the crust first right? When you say 7 tbsp butter, melted does it mean 7 tbsp melted butter or actually melted 7 tbsp of solid butter? I just made this and even though I followed the recipe to the T it came out brownish on the top.. its not burnt but looks brown… what did I do wrong? Hi Nicole. It’s totally normal to brown a bit, especially if your oven runs hot. You can avoid this next time by covering the top of the pan with foil for the last 20 minutes of baking. Hi Ester. I haven’t tried making this recipe into a mini version, so I can’t say for sure! But I think following the instructions (at least the bake time) for my mini key lime cheesecakes is a great jumping off point. This is absolutely scrumptious. It’s very creamy and smooth. I have my second cheesecake in the oven in three days (shared with friends). I made only two changes … just half the crust recipe in the second one as I’m not big on crust and instead of water bath I put a cake pan of very hot water under the cheesecake on the oven shelf below. I didn’t have any cracks on the first one. As far as cheesecake ingredients itself, I wouldn’t change a thing! I SOOOOO LOVE YOUR RECIPE… I did this and another version but did blueberry instead. beginner here.. Followed every instruction and this was my first cheesecake. Plus I’m new to baking. But I must say it came out picture perfect. Crack free. That smooth creamy texture. I’d say it came out better than many cheesecakes I’ve had If i must say so myself. I left this comment for someone who may be just like me; baking their first cheesecake and have a thing or two or maybe everything they can be worried about that can go wrong but here’s my advice, play your most soothing music put on your apron relax and have fun! Like I put on some Marvin Gaye and Curtis Mayfield and got in my zone and I’m 28 btw. Lol but please have fun with this recipe it’s fail proof from top to bottom. Like she said mixing is key. Set a timer and blend it for 3 mins straight, take a little 10 second hand break if you have a hand mixer like me and mix it for another 2 min straight and you’ll end up with the silky smooth batter just like me. And I do wanna say about the foil for the water bath. Five sheets of heavy duty store brand foil did it for me and it kept water out my crust. Just don’t be shy with the foil. Don’t just line the bottom; cover the bottom and make sure it at least makes it to the top of the pan and after the 5 sheets you should have a ring going around the edge of the pan and it completely seals the bottom. And instead of spray to oil the pan I used vegetable oil and flour mixed together and brushed that along my pan. I really just wanted to throw a few pointers for people that helped me along the way and thanks for blessing us with this awesome recipe!! My daughters love cheesecake and as I’m not an expert in baking, I always spent a fortune to get them the best cheesecake in the market. But this recipe changed everything. Making cheesecakes is NOT a mystery to me anymore! The recipe and the tips are awesome and my family can enjoy New York style cheese cake in my city. This is such a good recipe thank you. It’s also very forgiving! I forgot to add the flour and found I only had 4 eggs (I substituted 3 tbsp mayo). My husband is diabetic so I halved the graham crackers for a thinner crust also used Splenda. After reading about Soggy Bottoms in the reviews I was a bit worried as I had used reg foil not Heavy Duty. The cake had only been in the oven for 10 mins so I took it out removed the foil and put water bath on the bottom rack. I am pleased to say it turned out perfectly it was made for my husband for our 50th anniversary. I also used a can of no-sugar added cherry pie filler not fresh strawberries I admit but still good. You have to improvise sometimes. Thank you again for your recipe. This recipe is perfect! I’ve made 2 cheesecakes since I found this recipe. Thank you so much for sharing. It comes out perfect everytime. Also, thank you to the individual who advised to wrap the Springfold pan with a crock pot liner first. It avoids any mishaps. Thank you so much! Hello, does this require a metal spring foam pan? Or would a silicone with glass bottom work? I already have this pan and wanted to avoid buying a new one. Made this cake for my Sister in laws birthday (changed for an Oreo crust do to personal preference and aesthetic) and it was DELICIOUS! The instructions were well written and to avoid getting water inside I put a turkey bag inbetween the pan and the tin foil and cut it down to the same height as the pan. Oven safe and worked like a charm. Can this cheesecake be made ahead and frozen? I use a bigger spring foam pan? What would you recommend cooking time ? The filling looks great!!!!! BUT What if I didn’t put the foil high enough and m crust is wet?! 🙁 Is there a way I can fix it??? Hi 🙂 great recipe.. I am not a fan of cheesecake but made this for a family members birthday and came out amazing. everyone loved it.. thank you for your recipe…. i do have a quick question.. i want to use the same recipe( i.e same amount) but using 2 small pans instead. could i put both pans on the same rack and keep the same cooking/sitting time or would i have to adjust it? The cake is amazing. I’d like to experiment with different crusts so I’m considering buying a silicon or mini spring form pan. 1. Do you recommend silicon or metal spring form? 2. Should I still do a water bath with these smaller cakes? 3. How should I adjust baking time? Would you recommend using convection or convention oven for this cake? When you wrap the pan in foil… do you mean putvthe pan together and place in top of foil and fold the foil up around the outside of the spring form pan? Or do you mean to wrap the flare bottom piece of the springform pan and put it together? Hi, I have a hush rush question, I want to make this recipe for my husband, tonight. I have two questions. First, can I double the recipe and bake in a nine or ten-inch springform pan? Also, if I can double it, at what temp and how long should I bake it? Please help me!! Just made this for the second time. The first time must have been beginners luck. I wrapped it three times in foil and not one drop of water got in. The cheese cake was amazing. My family didn’t believe me that I made it. This time I wrapped it the exact same way and water got in. It’s in the refrigerator now chilling so hopefully it will be ok. I’m def doing it different next time. It’s too risky because abviously from reading the comments, water gets through A LOT. Great recipe tho! I have a standard cheesecake recipe for birthdays but decided to change it up for wife’s recent birthday. This is the best cheesecake I ever made. It comes out perfect every time I make it. I don’t usually leave a review but I just wanted to tell you how great your recipe is. My family always request it. We love your recipe. Thanks sooo much. This recipe is perfect. Hello Ashley, I was planning on making this cheesecake for a co-worker’s birthday and noticed in your recipe that you do not bake your crust. Would there be a problem if I decided to bake the crust for say 8-10 minutes? I’ve made lots of different kinds of cheesecakes and never not baked the crust. Thank you! This was literally the best cheesecake ever! It was my first successful cheesecake and I’m so happy with the results! I’d love to make this cheese cake in the 4 inch personal spring foam pans but I’m a little unsure how long to bake them. Could you please advise? My oven has a convection option. Would you recommend using it for this recipe? Hmmm mine got very dark on top. And cracked a lot. It also rose out of the pan a great deal. Temp of oven was as it should be. (Fan oven). I used a water bath too. Industrial type oven though. Just hope it’s not ruined. 1. How much cream chees is? 3 packages of 8 ounces each or 8 ounces of cream cheese in total? 2. how many portions you can get from this recipe? This is a great cheesecake! My 12 year old son helped me make it! I added lemon zest to the filling, just personal preference. This was extremely easy to make. I especially enjoyed all your tips, they certainly paid off. Thank you for making my family happy campers. Hi, I’m wondering if I can sub cornstarch for the flour. This is a perfect cake. i prepared it on sunday and my whole family just loved it. Thanx for sharing.